This book had its origin in lectures given by Sydney Cave at Cheshunt College, Cambridge. In its present form it is intended as a comprehensive statement of the Christian message aimed at teachers and preachers. This book is still in copyright. Permission to reproduce it on-line has been granted by the United Reformed Church. It can be used for educational purposes, but not sold for profit without permission from the copyright holder. It is not easy in these days to write on the Doctrines of the Christian Faith. The old infallibilities are gone, and Biblical Scholarship seems to many to have made insecure the foundations on which in the past theology has been built. Yet so long as there is Christian preaching there must be Christian theology, for theology has for its task the exploration of that message which it is the preacher’s privilege to proclaim. The Christian message precepts many problems. Yet it is not primarily an addition to our problems. It is Good News of God, a revelation of the character of God-in which is to be found the answer to those questions which are every man’s concern. It is this· conviction which has led to the writing of this book. It has been written in the hope that it may help some to a conception of Christianity less vulnerable than many of its older presentations, and yet as truly a gospel to be preached…. This brief outline of the Christianity was Intended to aid lay preachers in conveying the wholeness of the Christian faith and thought. This book is still in copyright. Permission to reproduce it on-line has been granted by E.C. Blackman’s family and the United Reformed Church. It can be used for educational purposes, but not sold for profit without permission from the copyright holders. 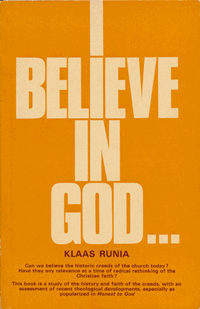 This little book is an attempt to set forth a rough outline of the Christian faith. It has in view the needs of Lay Preachers, and therefore does not presume that its readers will be trained in theology. It does, however, invite serious thought, and does not suggest that all is simple and capable of popular exposition. In spite of many omissions it is hoped that some idea is conveyed of the wholeness of Christian faith and thought; of Christianity, that is, not as a series of beliefs about this or that, plus a mainly negative ethic, but as an articulated system of belief, which contains within itself the motives of moral endeavour. We are here concerned with what Professor Farmer, in his book God and Men, calls “the unity and consistency” of the Christian view of life….